Eggless vanilla cake recipe is soft, spongy and moist basic cake recipe. It is made using condensed milk and without eggs. This Eggless vanilla cake recipe is my go to recipe when it comes to basic eggless cake without eggs. This cake has soft, moist and spongy texture. It is perfect cake for birthday party; you can decorate it however you like. 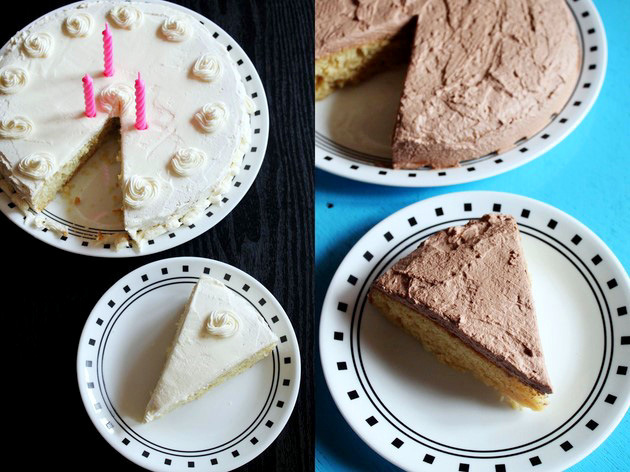 You can double the cake recipe and also frosting recipe and make layered cake. I am sure it will taste and look same as like bakery one. This recipe is my life saver when I have to make birthday cake for friend or casual dessert cake for small get together party. The ingredients require to make this vanilla sponge cake are very simple and you might have it in your pantry. This cake uses sweetened condensed milk in place of egg. It gives richness and sweetness to the cake. Are you making this during the Christmas ? I would say add some tutti frutti to the cake batter. it will be colorful and more festive. Or I have already shared eggless tutti frutti cake recipe. Once you make this eggless vanilla cake, I am sure you will fall in love with this cake just like me. 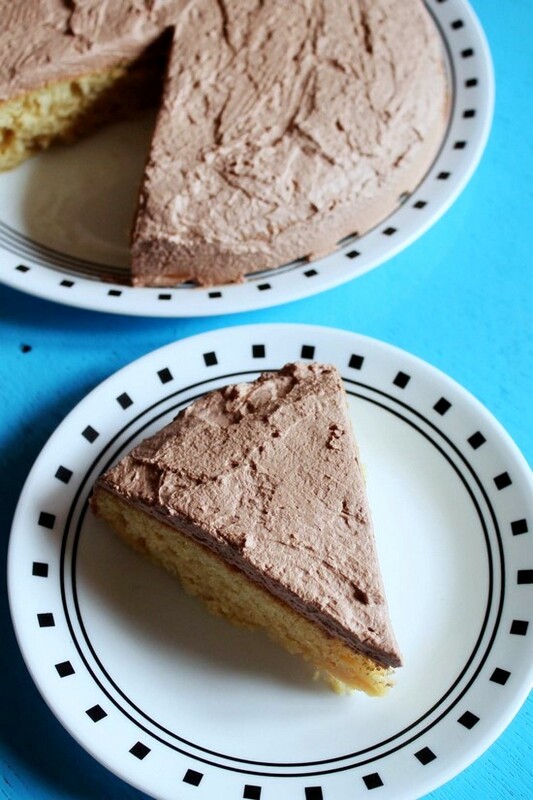 In this vanilla cake recipe I have made chocolate whipped cream as a frosting. It is creamy, light and fluffy with mild chocolate flavor. This chocolate flavor complements well with vanilla cake. I have made the same cake few months back and that time I made butter cream frosting to decorate the cake. Below left is the eggless vanilla cake with buttercream frosting and below right is with chocolate whipped cream frosting. For the variation, you can make this ganache frosting or chocolate buttercream frosting or spread any fruit jam glaze. Or drizzle the butterscotch sauce or chocolate sauce on top. Vanilla flavor goes very well with any other flavor. Choices are endless. you can frost or top or decorate it however you can imagine. Please share your idea with me, so I can adapt it for next time. 1) Pre-heat the oven to 350 degree F or 180 degree C for at least 10 minutes. 2) Grease a 9 inch round cake pan with butter or nonstick oil spray. 3) Take dry ingredients (all purpose flour, corn flour, baking soda, baking powder, salt) in a bowl. 4) Mix them well using wire whisk. Instead sift the flour mixture. 5) In another bowl take melted butter. Skip the salt above if using salted butter. add condensed milk. 7) Add water, vanilla extract and vinegar. again whisk it well. Please use good quality pure vanilla extract to get nice vanilla flavor. Stay away from artificial essence. 8) Add wet ingredients to dry mixture. 9) Mix well and make sure there are no lumps. 10) Pour the batter into prepared cake pan. 11) Bake in to pre-heated oven for 18-20 minutes. Check the cake by inserting a toothpick in the center. If toothpick comes out clean then cake is ready. 12) Let it cool in the pan for 5 minutes. Then loose the sides of the pan using knife. then remove it (upside down) on the wire rack. It is important to let it cool completely before you put the frosting on it. 13) To make chocolate whipped cream frosting – take heavy whipping cream, sugar and cocoa powder in a bowl. Make sure that your bowl, wire whisk and cream is chilled so it gets whipped nicely. I usually add cream in a bowl then keep the bowl and whisk in the freezer for 10 minutes. 14) Start whipping the cream. Do it by hand using wire whisk. It takes some time and effort. Or you can use stand mixer or hand mixer. 15) Whip it till you get nice soft peaks. Do not over beat it otherwise it will become grainy and it will not taste good at all. 16) Now cake is cooled completely, put the cake in a serving plate or cake stand. Add dollop of whipped cream on top. And using the butter knife or back of the spoon, start spreading the frosting evenly. 17) Don’t forget to cover the sides as well. I am not good at decorating or making smooth surface. I am sure you can do better job than me when it comes to decorating. 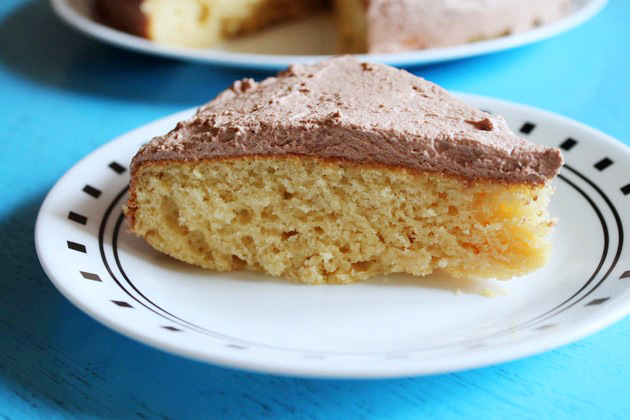 Come closer and see how spongy, moist and soft this eggless vanilla cake is from inside. Serving suggestion: Enjoy this eggless vanilla cake as a dessert. Many readers ask me if they can substitute the sweetened condensed milk. You cannot replace condensed milk with any other. FYI, it also known as mithai mate in India. Most important point. Let the cake cool completely. Then frost the cake. If the cake is slightly warm then frosting will start melting. Without any additional sugar this cake has perfect sweetness for us. If you like more sweet than you can add 2-3 tablespoons of sugar while adding condensed milk to the batter. You don’t have cornstarch or corn flour. Replace it with all purpose flour. Cornstarch gives light texture to the cake. Hence I have used here. This vanilla cake is made without eggs and still it is soft, moist, spongy and too good. As an egg replacement, sweetened condensed milk is used here. Pre-heat the oven to 350 degrees F or 180 degrees C for at least 10 minutes. Grease a 9 inch round cake pan with butter or spray with nonstick oil spray. Take dry ingredients (all purpose flour, corn flour, baking soda, baking powder, salt) in a bowl. Whisk them well using wire whisk. Instead sift the flour mixture. In another bowl take melted butter. add condensed milk. beat it well. Add water, vanilla extract and vinegar. again whisk it well. Mix well and make sure there are no lumps. Pour the batter into prepared cake pan. Bake in to pre-heated oven for 18-20 minutes. Check the cake by inserting a toothpick in the center. If toothpick comes out clean then cake is ready. Let it cool in the pan for 5 minutes. Then loose the sides of the pan using knife. then remove it (upside down) on the wire rack. It is important to let it cool completely before you put the frosting on it. take heavy whipping cream, sugar and cocoa powder in a bowl. Start beating the cream. Do it by hand using wire whisk. It takes some time and effort. Or you can use stand mixer or hand mixer. Whip it till you get nice soft peaks. Do not over beat it otherwise it will become grainy and it will not taste good at all. Now cake is cooled completely, put the cake in a serving plate or cake stand. Add dollop of whipped cream on top. And using the butter knife or back of the spoon, start spreading the frosting evenly. Don't forget to cover the sides as well. Can this same recipe be used to make cupcakes too? yes you can make cupcakes.